Is it a battle of the sexes? No, more like hide-and-seek, but it seems that the archetypal White Guy Anglo Saxon Gringo has witnessed what He experiences as threats to His sovereignty while there’s been an uptick in the perceived value of processes more Yin-like. Witness Madam Secretary, etc. There have been a lot of political cartoons, however, lately depicting the lady of the Statue of Liberty crying, or in despair, and other attitudes and postures depicting upsetness. There’s real meaning in her for us. She stands for something about America. 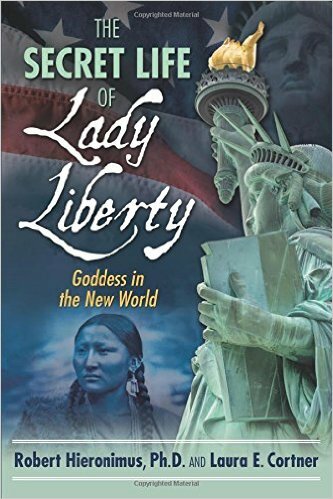 A new book is a wonderful story about her: The Secret Life of Lady Liberty: Goddess in the New World. A new story, or at least new to us, as the authors have dug up an all but forgotten history—and gosh, there’s a lot of it. Did you know that the original model for the lady in the statue was an Native American woman? There’s more, a lot more. It is amazing what all has been swept under the rug to make for a history more to our predelictions. This book is not alt-history: yet again, it does tell a different story than what you learned at that place the school bus took you to everyday. I remember Stanley Krippner introducing me to the first author, Robert Hieronimus, back in the 1970s, as he was developing what later came out as his book (that led to a Ph.D.) on why there is an eye in the middle of the pyramid on the back of the U.S. dollar bill: America's Secret Destiny: Spiritual Vision and the Founding of a Nation. Not a conspiracy theory, exactly, but it does seem that there was some kind of extra-supersensible guidance in the forming of our country, and it might have come from an elder woman of indigenous descent. The book has a lot of photos and it will be a treasure to those who appreciate this thread in American history. To explore The Secret Life of Lady Liberty at Amazon.com, click here!